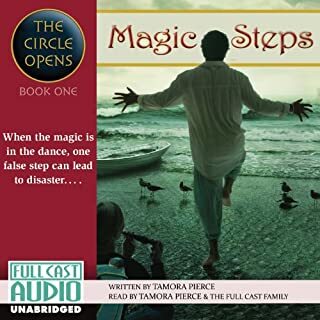 New York Times bestselling author Tamora Pierce returns to the magical world of Winding Circle. Set two years before the events of The Will of the Empress and Melting Stones, this adventure reunites plant mage Briar; his mentor, Rosethorn; and his young apprentice, Evvy, who has a talent for making stones...do things. The three journey eastward to the forbidding land of Yanjing, where they discover a danger that threatens the home temple of the Living Circle religion. 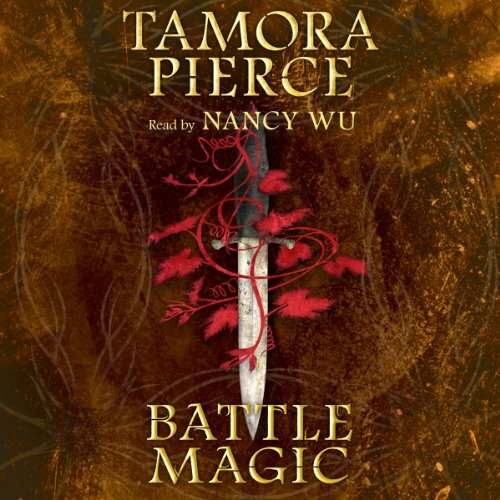 ©2013 © 2013 by Tamora Pierce (P)2013 Scholastic Inc.
What did you love best about Battle Magic? Nancy Wu's performance as Evvy is enthusiastic, youthful, and convincing as a 12 year old girl with immense magical abilities. Tamora Pierce's cultural and political designs are realistic, and the descriptions are vivid. Evvy's excitement, rosethorn's maturity, and briar's adolescence. The characters all came completely to life; Nancy Wu's performance is nuanced and diverse. I did, and am listening a second time. looking into Nancy Wu's other work, I enjoyed her narration and characters in particular! I absolutely adore Evvi, while I knew her from a different book that takes place after this one she still captured my heart during this story. She is so headstrong and honest, isn't afraid to tell it how she sees it and damn the consequences. She also would teach young children that it is good to learn when to shut their mouth. It always makes me happy to see books with strong young women in them, and Evvi is definitely one of them. She finds a way to help set the scene that I have a harder time doing when I read. I normally can picture something fine when I read, but Nancy really helps to bring the scene to life. Who knows, maybe I just imagine things better when listening and not reading. My reason for knocking a star off is that all of the other books that have Briar and Rosethorn in them are done as Full Cast Audio and I definitely missed that here. The cats.... being an animal lover I loved Evvi's cats. And that is all I will say so that there are no spoilers. While this book will make sense on its own I STRONGLY urge you to read or listen to a few other series first only so that you have the history of the characters. There is information in this book that will be spoilers for past ones. The series' that I would suggest are "The Circle of Magic" quartet and "The Circle Opens" quartet. Both follow Briar and his sisters before Battle Magic. It is totally possible to listen to "Melting Stones" before as well, but that follows after Battle Magic. However it doesn't give much away to this story. Tamora Pierce has a way of writing from many view points and building a world that is just amazing. Her worlds are always well-rounded and full, completely believable and they make you want to jump into the book and be a part of the story because of how well they are written. You often aren't left wondering about the big things, but even the littlest things are taken into account when talking about the cultures of the people in the book. She is consistent in those things that are mentioned often but aren't major to the story. I love a book with good world building. Where does Battle Magic rank among all the audiobooks you’ve listened to so far? Ive read ALL Tamora Pierce's books! They are amazing!!!!!! What other book might you compare Battle Magic to and why? i really enjoyed the whole thing! i liked the characters and how well they came alive throughout the stoy. 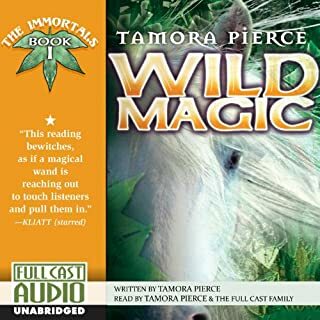 I've read almost all of Tamora Pierces novels, include Battle Magic. I also have the majority of them on audio via Audible. I enjoy listening to them while driving or doing other tasks. Battle Magic is a great novel. 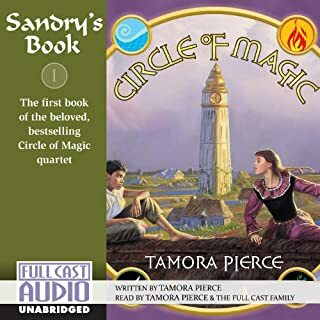 The characters are full of life, Tamora Pierce does yet again a wonderful job of drawing the reader into the story and weaving a good paced attention keeping tale. Unfortunately Nancy Wu narration slaughtered Battle Magic. I read the book before getting the audio. I was going to do a long drive and thought it would be nice to listen to the story. I got so irritated that midway through I had to turn it off. The way she changes the voices are horrid. At places she goes to a monotone voice and I felt myself not listening anymore. The story is a good one, that was the reader not the story. Sometimes I couldn't even tell that the speaker had changed except by the word "said" or such. The vocal reading didn't give any indication with change in inflection. She doesn't make any pause between section changes. The first time she went from the end of a sentence in one section (think context change within a chapter) - straight into the next without pausing , I thought the audio was broken. Then I realized what had happened. It happened again and again. Seriously. She completely ruined this story for me. Read the book instead. Who would you have cast as narrator instead of Nancy Wu? I would prefer to have Tamora Pierce and the cast of the other books do the narrative. And if not that - then someone who can at least read without just ruining everything together. The character of Briar Moss is an upstart street wise cocky kid who is maturing - but her narrative of him has absolutely none of that feel or playful tone, etc that goes with his character. I don't know the reasons why the narration was done differently for this book than the others, but it was a mistake to change. The story is great. 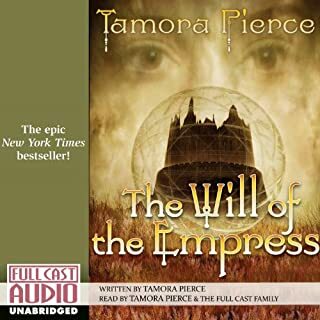 Tamora Pierce put out another well written novel. I did love the book - I hated the audio narration. I love Tamora Pierce! I especially love her description of the relationships between the mages and each mage and his/her magic. This book was a lot about court intrigue, political maneuvering, and warfare. Yes, the mages use their magic, but this book was neither charming (as her other books have been) nor particularly captivating. Still, it was nice to spend some time with Briar, Rosethorn, and Evie. I love this book and I own all of her books the narrator was good but I prefer the full cast audio books better I hope some day tris’s book and Daja’s book in the circle opens series get put into audio form as those are the only ones not in audio books yet. Long version: My irritation with this book isn't helped by confusion with the first two before Battle Magic. The first thing that had been bothering me about this series was the sudden appearance of a seemingly unknown traumatic backstory for Rosethorn, Briar, and Evvy. I kept stopping to make sure I hadn't missed a book somewhere. The way it's written, it's alluded that we should already know what happened to the group before Will of the Empress. The first two in the series don't tell you much, but keep referencing these unknown events. (I found it was like hearing an inside joke, or being left out of a conversation.) I kept wanting to scream, &quot;Just tell us what happened!!&quot;. Story was great though, so I kept going. Second book, Melting Stones, was even worse in the beginning, with the sudden appearance of another new, important character, Luvo, with almost no introduction or backstory. Also ended at a weird spot. More frustration. This book however, Battle Magic, irritated me the most. Battle Magic starts off, no Luvo. Where is Luvo? I kept waiting for a time reference, or an explanation. ONE HOUR into the book, all I can think of is how I really didn't need to know this much about the manners in these cities, so much bowing and scraping. No mention still of events that occurred in the last two books. Finally, when they get out of the city, over an hour into the audiobook, it hits me (with the help of a particular city name) that this book is covering the traumatic events talked about in the first two books. I had to shut the audiobook off for awhile. This REALLY should have been book 1 in this series. I don't know what the logic was for ordering them this way, but it kind of ruined it for me. The characters are wonderful, the stories are usually well done. This book left me feeling, in a word, irritated. Side note about the narrator: Extremely monotone. Not sure what the cause was for the loss of the Full Cast Audio, but they were sorely missed. Coupled with the slow start, her way of reading was very disjointed, slow, and confusing. After so many books with a group, it became hard to figure out who was speaking in the book. Maybe reading the physical copy would be better. I love the story in the voice acting. there were slow Parts but overall it is what I've come to have expected from the circle of magic circle of openings sagas. Would you listen to Battle Magic again? Why? What was one of the most memorable moments of Battle Magic? When Evvey found her cats after the torture - I don't want to ruin it for others so that's all I'm going to say about it. Which character – as performed by Nancy Wu – was your favourite? Evvey. I think that the character development- the personality that is emerging- is going to be amazing. Their lifes where not easy before .Briar - a thief living on the streets until he got caught once to often. Evvey a run away slave who was struggling to get enough food for herself and her 7 cats - but little did they know it was going to get even harder. I will get the rest of this series. This feels like a more grownup type of story - Tamara's books have never been all roses and good times but this seems to have some subjects that stand out . I always thought it would be fun seeing her interact with the other girls in Briars life too.